Whether it is through nurturing a tree in the yard or raising a potted plant on a window sill, make your child aware about the importance of creating and maintaining the earth’s green cover. 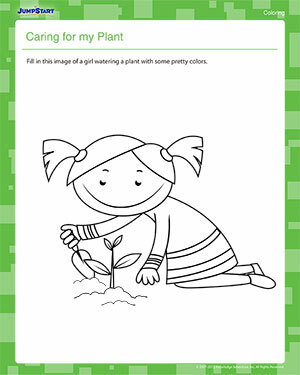 Caring for My Plant is an Earth Day coloring worksheet featuring a little girl caring for her equally little plant. Your kindergartner is sure to enjoy filling it in with some bright colors!